In the past few years there seems to have been an avalanche of gaming peripherals hitting the market targeted at those looking for that crucial edge against the opposition. We’ve seen customisable Macro keys, multi-coloured back lighting for that bling-bling factor, extra gaming keys tacked onto the side, and even LCD screens providing in-game data. While at least some of these are undeniably nifty features, we can’t help but long for something a little simpler in a keyboard, without all the “gamer” features that, let’s be honest, rarely see much use. Yes I’m talking to you G15 owners. 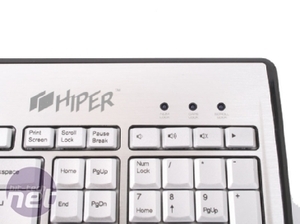 Hiper has obviously shared this sentiment, with its range of aluminium alloy keyboards looking to bring some handsome elegance to your desktop without the gratuitous feature fluff. Will we miss the mountain of extra features included with premium gaming keyboards? Let’s take a look and find out. 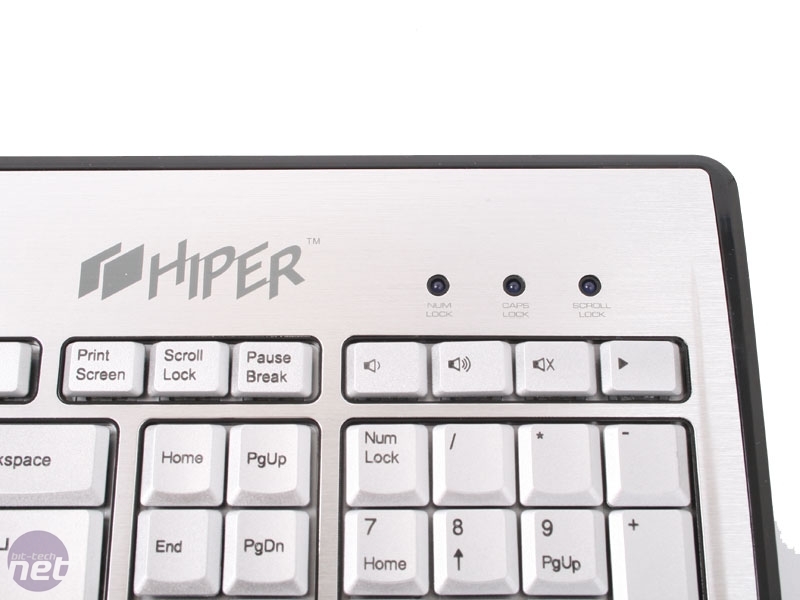 We’re taking a look at two lines of Hiper’s alloy keyboards today, and the first is the full size Superslim Alloy series, which certainly lives up to its name by measuring just 20mm at the thickest point. However, it wasn’t the size of the Superslim Alloy that first grabbed us, but the frankly gorgeous 2mm thick aluminium alloy plating used to cover the front side of the keyboard. It’s the same high grade alloy Hiper uses in its Osiris case and is not only perfectly moulded and cut, but also feels fantastic and is machined to a wonderfully smooth, finger friendly finish. Needless to say it also looks great, with simple styling letting the material do the talking – a refreshing change from the majority of premium keyboards which all too often bare more in common with neon lit chav wagons. 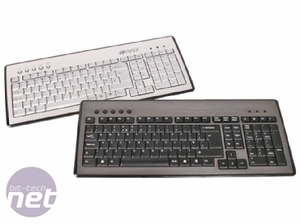 Available in either silver or gunmetal, the alloy plating is also mercifully finger print resistant. The alloy plating has been precision laser cut to fit perfectly around the keys, and there are no sharp or raised edges anywhere. 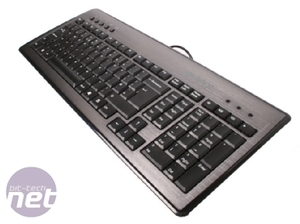 While the plating might be very well cut and durable though, the plastic housing underneath isn’t, and pressing keys in the centre of the keyboard hard will noticeably bend the entire board. 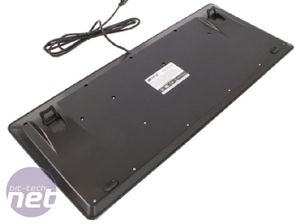 This is due to the layout of the underside, which crucially lacks a central support “bump” and means any pressure in the middle of the keyboard causes it to bend alarmingly. A real disappointment. 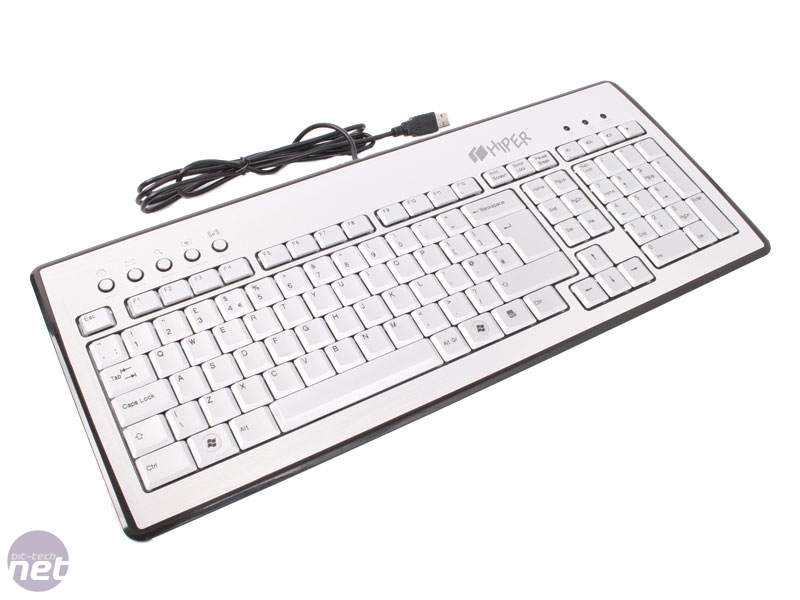 The key layout is fairly conventional for a QWERTY keyboard, although Hiper has, a little strangely, chosen to widen the Enter, Backspace and right Shift keys, rearranging the rest of the board to accommodate. It’s not a major problem, but is a little confusing when you’re looking for the Insert key and it’s been moved to an unfamiliar position. 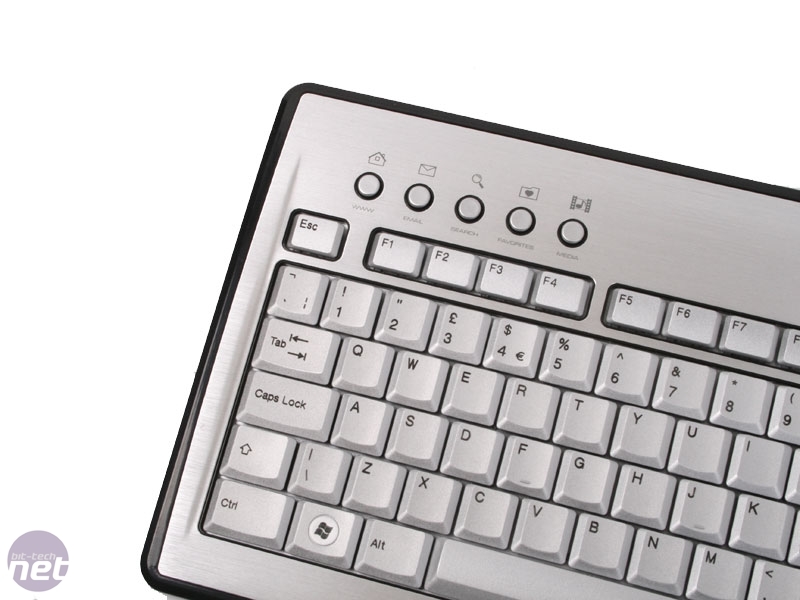 The keys themselves are the laptop style low profile scissor type and are very easy to type with while still retaining the decent degree of movement needed for comfortable gaming. 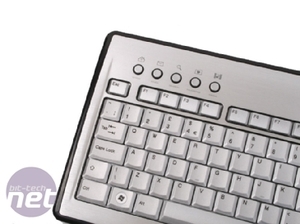 There’s also a nice little bonus for those who opt for the Silver version with the additional of individually inscribed keys; those who opt for the gunmetal version will just get the standard stickered keys. There’s also a selection of shortcut keys, although crucially no media keys, and some very funky purple (and slightly UV) LEDs for num/scroll/caps lock round out the package. 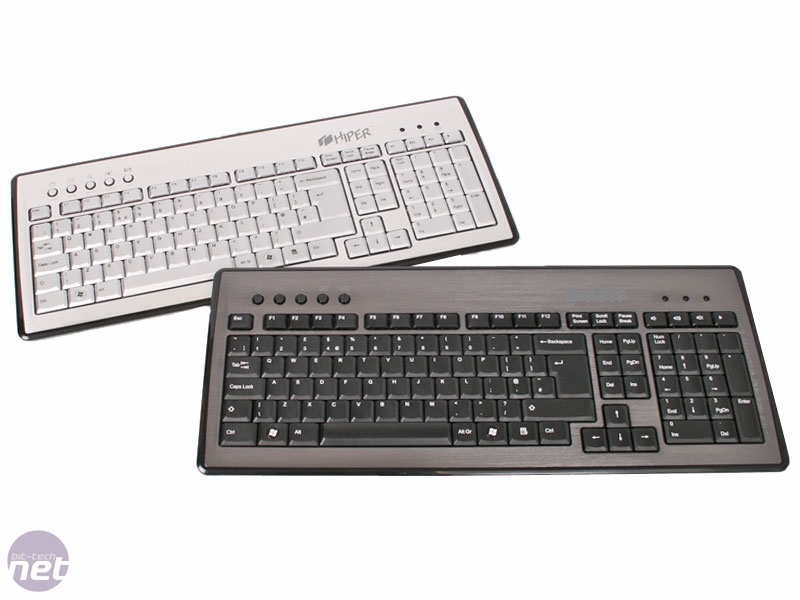 Price wise the Superslim Alloy range can be picked up for just £17.24, a veritable bargain for a decent and stylish aluminium keyboard. 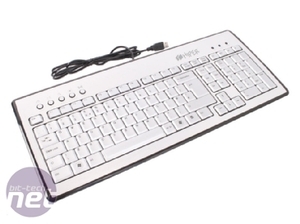 Sadly though the lack of middle support and worrying keyboard bend if you apply any sort of pressure in the middle puts us off, and spoils what otherwise is a stylish and refreshingly simple keyboard.